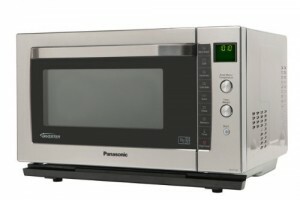 Following up our recent reviews of combination microwaves is a look at the latest model from Panasonic, which is made with the larger household in mind. The Panasonic NN-CF778SBPQ is a Combination Microwave Oven aimed at medium to large sized families and kitchens, providing 1000w of power and substantial 27 litre capacity. Finished in a fingerprint-free brushed stainless steel and smart black exterior, the NN-CF778SBPQ features a simple twelve button control system, which is essentially ten, as two of the buttons are reserved for starting and stopping the appliance. 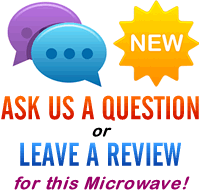 This is increasingly rare for a high end microwave as, in our experience, the more expensive models are usually more difficult to operate due to the increased functions the manufacturer has had to cram in. So is it as good as the specification implies? Keep reading to find out! The NN-CF778SBPQ works incredibly well, looks great, and will last for years. Quite a lot of money to invest in a microwave, so maybe above some people's budgets - it does represent excellent value though. Billed as a family sized microwave oven, the Panasonic NN-CF778SBPQ is priced at the higher end of the microwave market, and opens more in a similar manner to a traditional convection oven rather than a microwave, with the hinges located at the base of the door. This provides an additional shelf when removing or stirring food, thus saving your kitchen surface from being marked or spilled upon. Offering 1000w of power from within it's stainless steel construction, and a substantial 27ltr capacity, on face value it is certainly built to be both practical and long lasting. The setup was easy - controls are well labelled and thought out - the Panasonic microwave has a range of settings from defrost to high, and the power used for each of these (in terms of watts) is included with the NN-CF778SBPQ's manual provided. Inside the box you'll find the NN-CF778SBPQ microwave oven, the instruction and recipe book, the square shaped enamel and wire shelves, as well as a glass tray and anti spark ring. As mentioned above, just twelve buttons are used to control this appliance's various features, and each one is clearly labelled with a practical symbol and crisp white text - no complaints from us whatsoever! Too many products on the market require the user to repeatedly check the manual prior to getting started - not so here - the square buttons for the Microwave, Grill, Convection, Turbo Bake, Auto, Chaos, Memory and Timer are all simple to decipher, and large enough to press accurately even in a hurry. One slight downside is that unfortunately there's no information on the relationship between the oven settings on this microwave and the equivalent temperature of a regular convection oven, so that you can adjust recipes to suit (i.e. whether the mid range setting equals 200 Celsius etc) - asides from that the manual is a touch on the plain side but helpful. It's also worth pointing out that for safety reasons Panasonic recommend that you leave a gap to the sides of the NN-CF778SBPQ microwave, so if space is tight then please bear this in mind - otherwise it may cause overheating and possibly a malfunction. Being 27 litres, the space inside is cleverly increased yet further by the lack of a turntable - the magnetron is located under the ceramic base of the silver microwave, and as such is both spacious and easy to clean. Our testers were impressed by the size of the Panasonic NN-CF778SBPQ 27 litre microwave, as well as how easily it could be maintained - it's surprising how much more simple it can be when there's no turntable to clean. "I was astonished at how much I can fit inside this microwave - no turntable means a lot more room for food, and also means that larger square and rectangular plates can be catered for, as there's no rotation to worry about. We had this model for just over a week, and I was initially a bit apprehensive as I don't have much free time to learn how to use it - my fears were soon allayed once I got it out of the box, and within 5 minutes I was heating up my lunch! Over the week I used it for everything from my porridge in the morning to the roast on Sunday, and it did a great job - even heating with no cold areas. I was sad to hand it back, and am severely tempted to get one myself - it's a major upgrade on my existing microwave. Thumbs up from us!" "This microwave is probably out of my budget at the moment, so I jumped at the chance to have a trial run - safe to say it put my current cheaper model to shame. I always thought that a microwave was a microwave - that they're all fairly similar in performance - however this Panasonic is far superior to my existing model - defrosting using the Chaos system was the function I used the most, as I have a freezer full of food - my current microwave tends to half cook the item when on defrost - it's a bit of a tight rope. This is particularly annoying when you are trying to defrost a piece of meat but not cook it at all. The Panasonic did a sterling job, and in the two weeks I had it I honestly can't think of a single dish I messed up. I was gutted that I had to give it back!" So who is the Panasonic NN-CF778SBPQ aimed at? Given Panasonic's reputation for creating reliable and effective products, we can't foresee any issues with durability with the NN-CF778SBPQ microwave, and all in all it should prove to be a versatile and effective method of cooking, and a handy alternative to using the hob or regular convection oven. Aesthetically it's pretty stylish, and will match any modern kitchen. Finally, if you're not convinced by us - then check out either Which or Good Housekeeping magazine's reviews of the NN-CF778SBPQ and you'll see that it is held in high regard. Yes, it is a touch pricey, but this microwave works exceedingly well - a true fit and forget kitchen appliance, which is exactly the way they should be in a perfect world. If you're after a high end, reliable and highly functional microwave, then the Panasonic NN-CF778SBPQ is worth buying. Granted, it is expensive, but it will last you a long time, and performs very well indeed. The ultimate fit and forget combination microwave.